Apple was granted yet another stylus design patent on Tuesday, this time coming in the form of a smart pen capable of detecting hand movements for translation into digital line drawings and text. 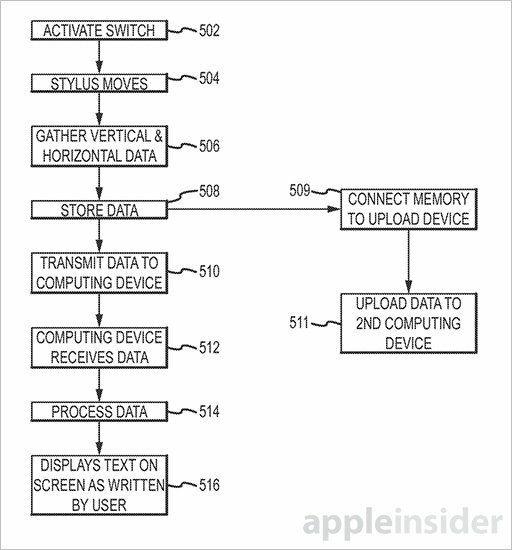 The U.S. Patent and Trademark Office awarded Apple U.S. Patent No. 8,922,530 for a "Communicating stylus," which outlines a smart writing utensil that uses accelerometers, wireless communication hardware and onboard storage to transfer hand-written notes and drawings onto the display of a digital device. A number of companies have created similar products, the most relevant being Livescribe's "smartpen," though few boast the complete complement of advanced technology set forth by Apple's design. The Livescribe 3, for example, uses an infrared camera located in its tip to capture handwriting, which is then stored onboard or offloaded via Bluetooth. The process requires specialized paper, a relatively large chassis and a copious amount of power. 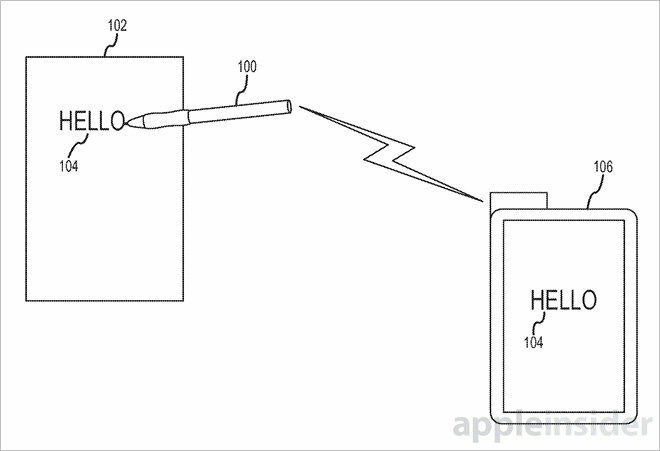 Apple's stylus is based on efficient accelerometers or other motion-sensing hardware. In practice, Apple's pen activates only when picked up, its nib is pressed to paper, withdrawn from a dock or manually turned on by the user. From there, onboard sensors track position changes in relation to an initial zero point, allowing the device to send realtime data for translation and graphical representation on an iOS device's screen. The stylus can be configured to transmit movement data after a certain amount is collected, at predefined intervals or continuously, depending on user need. Another option is sending out stylus data to multiple devices, perhaps as meeting notes. For example, if the stylus were being used on a whiteboard, perhaps in a large classroom setting, the operator may require realtime reproduction for displaying output on a larger digital display. It should be noted that Apple's invention can be fitted with multiple accelerometers to measure movement in three dimensions, thus producing an accurate digital copy of stylus motion at any angle, whether it be on a desk, wall or in the air. Other instances may not call for instant playback, such as note taking, in which case the stylus may save movement data onboard or conduct burst transmissions to save energy. Apple points out that a user can transmit data to a computing device that remains in their pocket or bag, a seamless solution for saving digital backups of physical notes. Alternative embodiments include multiple transmitter and receiver configurations for location triangulation, embedded magnetometers for gathering orientation data and various nib layouts for writing with ink, graphite and other materials. Also noted is a capacitive version that can be used with as a traditional iPad stylus. As with other Apple patents regarding styli, the prospect of one actually making it to production is slim considering the enormous efforts put into a multitouch interface. The technology to build a "communicating stylus" has long been available should Apple decide to build such a device. Indeed, most of the hardware mentioned in the patent are already being used in current-generation iPhones and iPads. 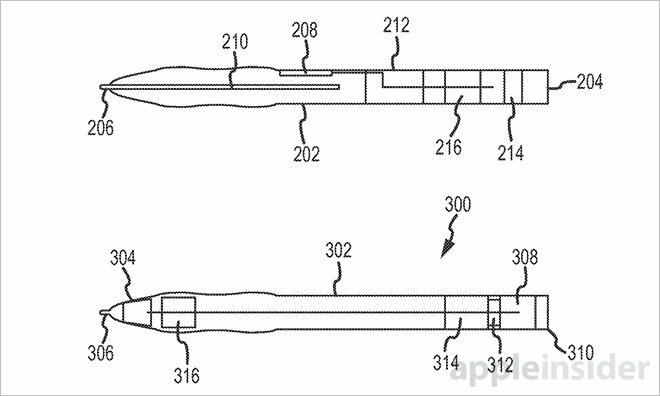 Apple's smart pen patent was first filed for in January 2010 and credits Aleksandar Pance as its inventor.